Before I will go into details regarding sightseeing in Ehrenhausen, let′s start with some background. Up to the late 17th century, Austria was a pretty sad place battered by various religious wars between pro-Emperor Catholics and anti-Emperor Protestants, Turkish invasions and all kinds of conflicts. After the 30-Years-War, religious issues settled (which were, in fact, about power rather than religion anyway) and around 1700, the Turks were finally defeated. Austria expanded with an enormous pace and generals made fortunes rivalling those of the Habsburgs. So basically, there were two main ways of making a vast amount of money in the 17th and early 18th century: Take it from the Turks or from other nobility that fell into disgrace due to disloyalty against the Emperor. In the case of the Counts of Eggenberg, the Turkish Wars provided an opportunity to establish themselves among Austria′s top-notch nobility. As early as in 1593, Ruprecht of Eggenberg showed a talent in kicking Turkish butts at the "Battle of Sisak". Back in these days, such a talent was highly lucrative and soon Count Ruprecht had the financial confidence to be able to hire the Italian architect Pietro de Pomis. The Italian built a tomb worth while a count: The Mausoleum of Ehrenhausen was finished in 1611, just before Ruprecht died. Eighty years later, star-architect Fischer von Erlach was hired to design the interiors of the mausoleum. Today, it is one of the main attraction of Ehrenhausen, an otherwise tranquil village of extremely rural taste. The mausoleum might be the most significant mark that the Eggenbergs left in the city, but by far not the only one. There are several buildings where you can spot the family′s coat of arms. Most importantly, though, Ehrenhausen is also the site of the Eggenbergs′ main fortress. The 16h century building was one of Austria′s numerous fortifications that secured the South and the East of the country against the Turks. Beyond mausoleum and fortress, don′t miss out on the parish church, a typically Austrian mix of styles. The obligatory market square invites visitors to stroll around and explore the village. Beyond that, Ehrenhausen makes a good starting point for exploring the most rural areas of Styria. Similar to nearby Leibnitz, it serves as a bridge into some of Austria′s most remote villages. Nearby Gamlitz has an own castle and has some things in common with Ehrenhausen. Leutschach and Ebiswald are both big players in wine production, but small in every other sense. 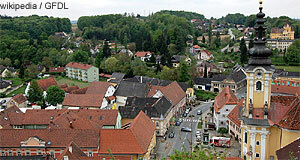 Ratsch has not only a funny name, but is also a charming spot, and so is the village of Spielfeld. If you are willing to drive a bit further, don′t miss out on Bad Radkersburg with its Medieval core. From there, you can access the "Road of the Castles" that includes castles of Styria and the Burgenland.